Welcome to the Portfolio X developed by the FX Hunter Wealth. 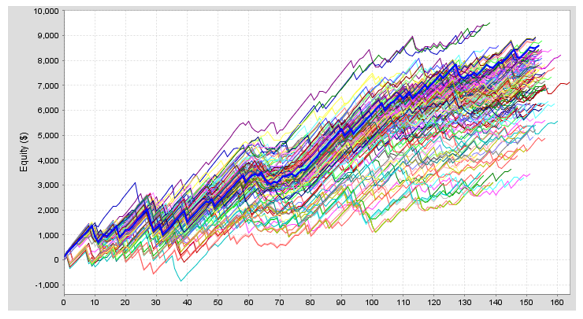 Portfolio X contains 16 uncorrelated fully automated strategies. Developed for EURUSD, GBPUSD, EURJPY, GBPJPY, USDJPY.The Portfolio X strategies are short term and long term expert advisors. Every strategy has a positive risk reward ratio. No Martingale, Grid, Averaging, Arbitrage, Hedging or any other technique is used. All strategies are simple and every order has SL , TP and own risk management, which is possible to set as perthe traders risk acceptance. All tests were performed for the past 15 years with 99.9% quality tick data.Before we will explain how the each strategy in the portfolio works. Let us first explain the procedure how we developed and strictly tested all parts of the portfolio and then it´s all together. 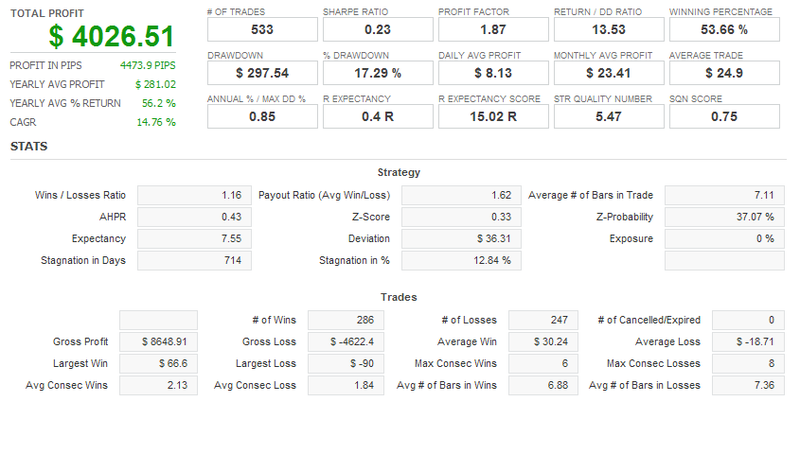 Strategies and the settings which didn´t pass one of the tests since the beginning were eliminated from the portfolio. This is first step for the further developments of the portfolio. Than the strategies was tested in the out of sample period 26.12.20013 – end of the year 2017. Next condition is that all strategies who passed In/out sample test, must generate profit in a year 2018. This tests changes the past trades to the random order and as well change randomly the number of the trades. Thanks to this test we have a chance to see how would the strategy behave in the different market conditions.Then we can choose the most optimal settings which will be flexible for all market changes. We are not looking for the most profitable settings, but for the one which is the most stable. We can raise profitability later with adjusting the risk and the position sizes. The blue line on the picture below is the most optimal. The volatility tests randomly changed the candles sizes for a 20% up or down. This test simulated changes on the market cycles and gave us more certainty about the stability of the tested strategies for future. In these tests we have been again looking for the strategy settings that produce stable results in unexpected volatility changes. Showed us the average range of the Targets and Stop levels. Every strategy in the portfolio has a flexible system of placing these levels as per volatility of the market measured by the average true range (ATR). Every strategy has a positive risk ratio it means TP distance is always bigger than our SL distance. We are risking less for bigger profits, Always!! We want to be sure that all strategies with the specific settings, which passed our already hard previous test are not over optimized. So we did these two final tests, which filtered out many of those strategies, which came successfully into this stage. Time frame change – All strategies have the best trading results on the time frame which they have been developed for. But we want to be sure that they work well at different time frames as well. Strategies has to work well on higher and lower time frames than is the main time frame for the strategy. If any strategy doesn´t perform well, then it could not be added to the portfolio. The main idea of the portfolio is that it´s based on uncorrelated FX pairs. Uncorrelated means that the pairs don´t have to necessarily move together, nor they necessarily move in opposite directions. Hence, they are uncorrelated. Implementation the basics of this idea was inspired by a mutual fund, The Permanent Portfolio Fund that has out performed the overall markets over the years. We have selected 16 strategies with specific settings, which had passed all the previous test and has been profitable in the back tests with 99.9% tick data since 2004 till today January 2019. 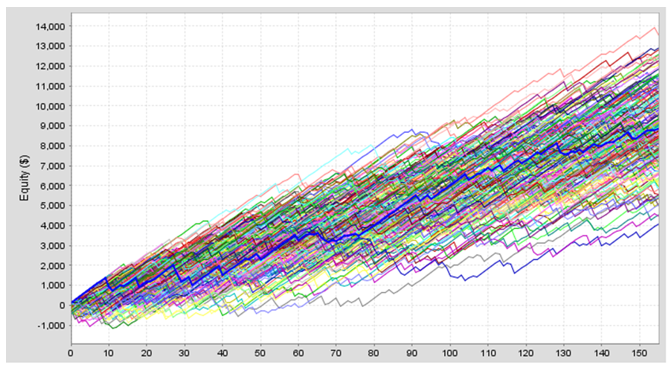 We had to do the Monte Carlo and Volatility change tests again. But now for all sixteen strategies together. Its was the same test as in phases 2. and 3, but now we are doing the same procedure with whole portfolio. This tests showed us the stability and reactions of the portfolio to the changes in the markets. The results are very acceptable and the portfolio still generates stable profits. 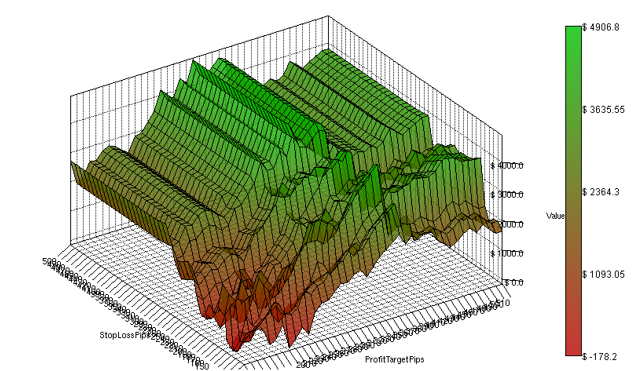 Portfolio X contains 16 strategies with the different trading logic. The portfolio basically works with two triangles of GBP, EUR, USD and JPY currencies, which guarantee that we can´t never lost all equity and the risk of all strategies together is not multiplied, but added together. This was the ten important steps we have done when we have been developing a portfolio in past 6 months. The conclusion is clear. This is a professional, fully automated, robust trading system, which has ability to work consistently in all market conditions for a long time in future. We can basically set it and forget all stress and worries which comes with trading. We don´t have to be worried anymore on the market crashes, long term trends or sharp moves. This system contains strategies that can benefit on these occasions. The Portfolio X doesn´t use martingale, averaging or any other dangerous trading techniques. The Portfolio X is not for the chancers who believes they can get rich overnight. Or those who are still thinking that FX has some secret special formula. In a fact FX is a game of the probabilities, patience, tilt the trading edge to our sides and mainly about reducing and controlling the risk. And this is all what portfolio x brings together. Risk management of the Portfolio X is more advanced than in common commercial EA´s. We again used the period of last 15 years and starting balance $1000 for the tests. These tests generated data to work with. The tables below shows that each strategy has set own default lots sizes, which is possible adjust to change the risk dependents on our account sizes and risk acceptance as a trader. We have calculated the maximum possible drawdown and average yearly profit for each version of the portfolio with defined lot sizes which can be reduced or raised. The Portfolio X tests have performed with an overall maximum drawdown $280 and yearly average profit $5036. If we want to reduce or raise the risk to different accounts we can adjust the default values of lots sizes. By reducing positions for 50% we will have a maximum drawdown $294 while the expected profitability can be around $2500 yearly. So the portfolio can be traded even on small $500 accounts if we reduce the position sizes. Same logic is for the raising the lots sizes. Deviation +/-10%. The tests of 8 strategies have performed with an overall maximum draw down $424 and yearly average profit $2570. If we want to reduce or raise the risk to different accounts we can adjust the default values of lots sizes. By raising positions for 50% we will have a maximum draw down $850 while the expected profitability can be around $5000 yearly. However we must think about the risk properly. Support can helps with calculations. Deviation +/-10%. 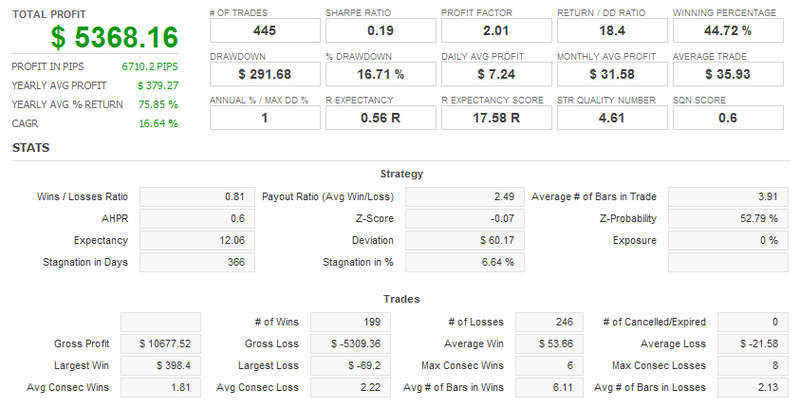 The tests of 4 strategies have performed with an overall maximum drawdown $280 and yearly average profit $980. If we want to reduce or raise the risk to different accounts we can adjust the default values of lots sizes. By raising the positions for 25% we will have a maximum drawdown $420 while the expected profitability can be around $1500 yearly. Deviation +/-10%. All strategies in Portfolio X have been back tested for the 15 years period with 99.9% quality tick data with fixed lots size settings. The strategies are optimized for the middle risk and will be able to generate great performance in the future with +/- 10% deviance. If you click on the YouTube icons in left corner of the equity curve it will open for you video back test with percentage per trade settings. Trading logic is based one the BollingerBand, BBWidht Ratio and Ichimoku filtering entries. SL and PT are calculated by ATR (average true range). Trailing stop is applied to follow the market trend and exits if shooting star candle pattern occur in an uptrend or Hammer candle in a downtrend. This strategy have ability to earn profits on advantages of long term trends. Trading logic is based on the Bollinger Bands and to filter entries. SL nd PT are calculated by ATR (average true range). This strategy doesn’t use Break Even or Trailing stop and exits from markets after 10 trading days if is in profit and PT not reached yet. Orders expires after 4 bars. Trading logic is based on the Heiken Ashi and BBWidth Ratio for the Stop Limit orders. SL and PT are calculated by ATR (average true range). Trailing stop is applied when in profit. Stop/Limit order expires after 12 bars. Trading logic is the MACD and Bollinger Band_Range for the Stop Limit orders. SL and PT are calculated by ATR (average true range). Break even is not applied in this intraday strategy. Stop/Limit order expires after 6 bars. Trading logic is based on the Macd and BBWidth Ratio and Ichimoku for the Stop Limit orders. SL and PT are calculated by ATR (average true range). Trailing stop is applied when in profit. Stop/Limit order expires after 8 bars. Trading Logic is based on the Bollinger bands range for the Stop Limit orders. SL and PT are calculated by ATR (average true range). Trailing stop is applied with ATR calculations. Stop/Limit order expires after 13 bars. Trading logic is based on the Stochastic and BBWidth Ratio for the Stop Limit orders. SL and PT are calculated by ATR (average true range). Trailing stop is applied when in profit. Stop/Limit order expires after 15 bars. Trading logic is based on the CCI, Keltner and BBWidth Ratio for the Stop Limit orders. SL and PT are calculated by ATR (average true range). Trailing stop is applied when in profit. Stop/Limit order expires after 9 bars. Trading logic is based on the Heiken Ashi and BBWidth Ratio for the Stop Limit orders. SL and PT are calculated by ATR (average true range). Trailing stop is applied when in profit. Stop/Limit order expires after 1 bars. Trading logic is based on Ichimoku and BBWidth Ratio for the Stop Limit orders. SL and PT are calculated by ATR (average true range). Break even is applied when in profit. Stop/Limit order expires after 28 bars. Trading logic is based on the MACD and BBWidth Ratio for the Stop Limit orders. SL and PT are calculated by ATR (average true range). Stop/Limit order expires after 6 bars. FX HUNTER X FOURTEEN (EURJPY_H1) Trading logic is based on the BBWidth Ratio for the Stop Limit orders. SL and PT are calculated by ATR (average true range). Break even is applied when in profit. Stop/Limit order expires after 17 bars. Trading logic is based on Bullish Engulfing patterns and custom indicator BBWidth Ratio for the Stop Limit orders. SL and PT are calculated by ATR (average true range). Stop/Limit order expires after 6 bars. Trading logic is based on the Bollinger Bands for the Stop Limit orders. SL and PT are calculated by ATR (average true range). Break even is applied when trades are in the profit. Order expires after 50 bars.